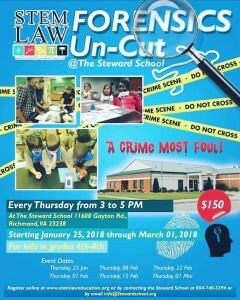 STEM Law presents Forensics Un-cut at the Steward School, Richmond Virginia on Jan. 25th, Feb. 1st, Feb 8th, Feb. 15th, Feb. 22d and March 1st. STEM-Law will be a presenter at the National Society for Black Engineers (NSBE) National Convention, scheduled for March 21-25 in Pittsburg, Pennsylvania. Our organization was formally invited to deliver our STEM Escape Room. During this event NSBE Jr. Chapters will compete to escape from the STEM Escape Room by completing complex and rigorous problem-based learning activities culminating in their “escape” of a notional escape room. Our goal is to secure a corporate sponsor and have this event included as a yearly event at the NSBE convention, similar to the Math Triathlon and Robotics Competition. STEM-Law has been selected as a 2018 STEMulating Young Minds Institute (SYMI) program participant. We have received full sponsorship to attend the 44th Annual NSBE Convention in Pittsburgh, Pennsylvania from Sunday, March 18th through Saturday, March 24th 2018. As a new NSBE Jr advisor, this opportunity equips our team with the knowledge necessary to successfully charter and/or maintain a NSBE Jr. Chapter; present an in-depth overview of the STEM programs NSBE offers; and will provide you with opportunities to observe NSBE Jr. chapters competing at the 2018 NSBE Convention while shadowing a seasoned NSBE Jr. advisor. It is our goal to secure multiple corporate sponsors for our future programming activities. On Monday, April 12, 2018. 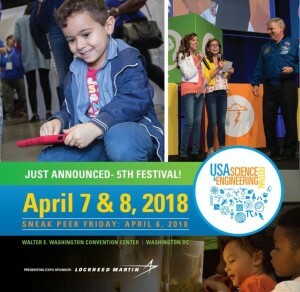 STEM-Law is an invited guest at the USA Science & Engineering Festical Expo. Scheduled for April 7-8, 2018 in Washington, D.C. The STEM-Law Education program was featured on Richmond Virginia’s CW Richmond TV station as a feature activity during it’s very popular CWhatsUPVa. This commercial hit over 275,000 homes in the Richmond metro area. This video shared our private screening of Hidden Figures. 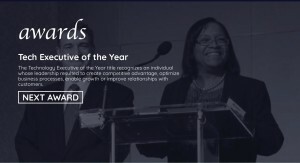 Our team spans beyond educators…, we thank award-winning actress Karan Kendrick. Karan plays Mrs. Joylette Coleman, Katherine Johnson’s mom in the move Hidden Figures. Katherine Johnson (Coleman) is a Hampton Institute graduate and Award-winning actress Taraji Penda Henson plays her role in the movie. Karan, and STEM-Law Founder Michael Edwards are both from Fort Valley, Georgia. We thank Karan so much for producing this video for our private showing! Thanks to the ABC12 News Team for welcoming STEM-Law Founder Michael Edwards, and his daughter Lauren to their Richmond studios. Michael and Lauren met with news team to share the mission, vision and goals of the STEM-Law program. Our team thanks ABC12 for supporting our initiative, and for showing Lauren such a great time!